Do you hear that? Of course you don’t. The sound of tranquility is so soft I can hear our dog snoring through her mid-morning nap from two rooms away, un-interrupted by squabbles over Barbie shoes. * One Last Weekend Getaway – Sounds like a great idea, until you arrive at the cabin only to realize a geographic change is NOT going to change the fact that the 10-year-old still thinks she is still way too cool for the rest of the family. *School Supplies – The purchase of the perfect pencils and binder set the tone for the entire school year. Did you know a second grade girl requires a minimum of 5 images of Hello Kitty and two monkeys amongst her gear? And a fourth grader…is too cool for anything offered by Target or Staples. *The Cello – Yes, the little one, all 38 pounds of her, insists on playing cello. (If you knew her…). We have negotiated through the great debate with her music teacher and the music store found an instrument for her 44 inch frame. Who knew there is such a thing as a 1/8 sized cello – any smaller and they’d have to give her a viola. The official start of the school year was yesterday. Although the temptation to return into the blissful yet snarky blogosphere was great, I decided to take the day to simply get my ducks in a row. I did more before 9 am than I was able to accomplish in an entire summer day; the occupation of “Chick Fight Referee” chipped away at any hope of productivity. Whisk together the sugar and sour cream first, then stir in the coconut. It’s that simple. The most difficult part is to remember to mix together a couple of hours ahead of time, it needs to sit in the refrigerator for an hour or two to let the sugar completely dissolve. Don’t worry, it makes enough to have enough “left over” to eat with the spatula. This sits on our counter, perched atop a candle stand, Nola thought it was too cute to eat. Have I ever mentioned we have a pet coconut? In my book…you get THE Trophy! Congratulations on all of the above………..
Good thinking….plan ahead. Always a good thing! We got lucky on school supplies although the 7 y.o. wondered why his ‘red’ folder was a star wars folder. Can we say the night before school shopping and there was not a single red folder left in Target? Totally! And we could not find a pack of plain yellow post it notes either, though still wondering what that item was doing on a 2nd graders list…. The frosting sounds like it would be good on a devil’s food cake! Hahaha I can relate to both you AND your ten year old. I was once the “last year’s clothes? !” and too cool for school kinda kid, and now that my older, I see my sister doing the same thing. Never changes, does it? At least you survived. 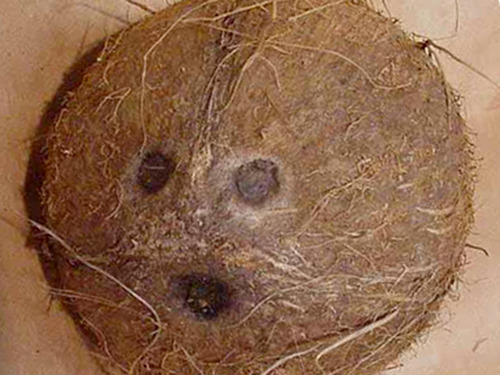 The coconut face is perfect – for any season – come to think of it.